lighting and control room is essential to produce a polished end result. Even better, it's amazingly affordable! 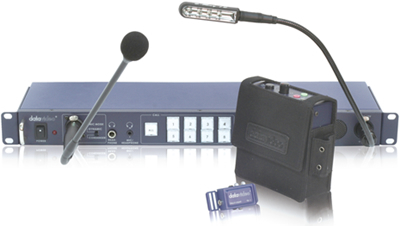 The Datavideo ITC-100 Intercom System provides 8-Way talkback and tally indicators. The director can select to talk to an individual channel or to all channels simultaneously. High S/N ratio and full duplex design makes the communication crisp and clear. The ITC-100 is a standard 19”/1U rack design, so it is easy to integrate into any rack system for using in the field or studio. The ITC-100 includes 4 ITC-100SL Belt Packs, 65' cables, main station, tally lights and cables, gooseneck mic, lamp and 4 headsets. 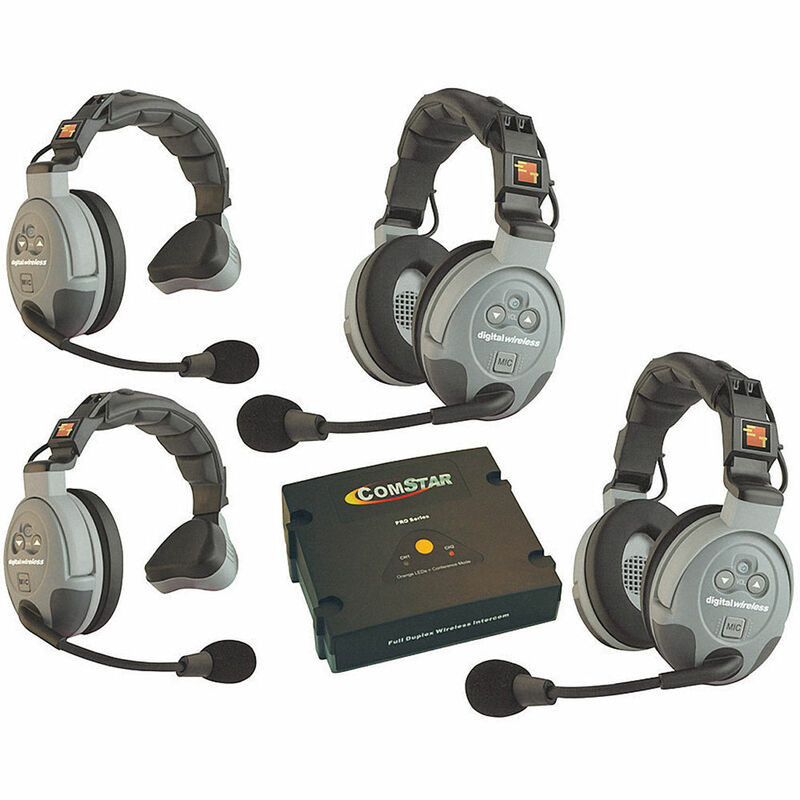 The COMSTAR XT-4 4-User Full Duplex Wireless Intercom System from Eartec is a fully functional wireless intercom that offers full duplex communication in a simple design which does not require the use of beltpacks. 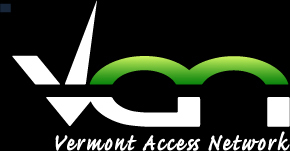 The system consists of a Com-Center base station and four wireless headsets. Additional headsets can be added to the system, allowing you to create a wireless network of up to eight users who can all communicate simultaneously with no delay or voice activation, ideal for applications where teams need full use of their hands. You can even split users into two groups of four people, or bring everyone together in conference mode. The long-time industry standard for analog intercom systems for vieo production, theater communications, sporting events, stage crews, etc. Compact, feature-laden, single rack-space intercom main station supports up to 40 RS-701 beltpacks, 10 speaker stations or 12 headset stations on two channels. Digital, Wireless and IP based intercom systems too! 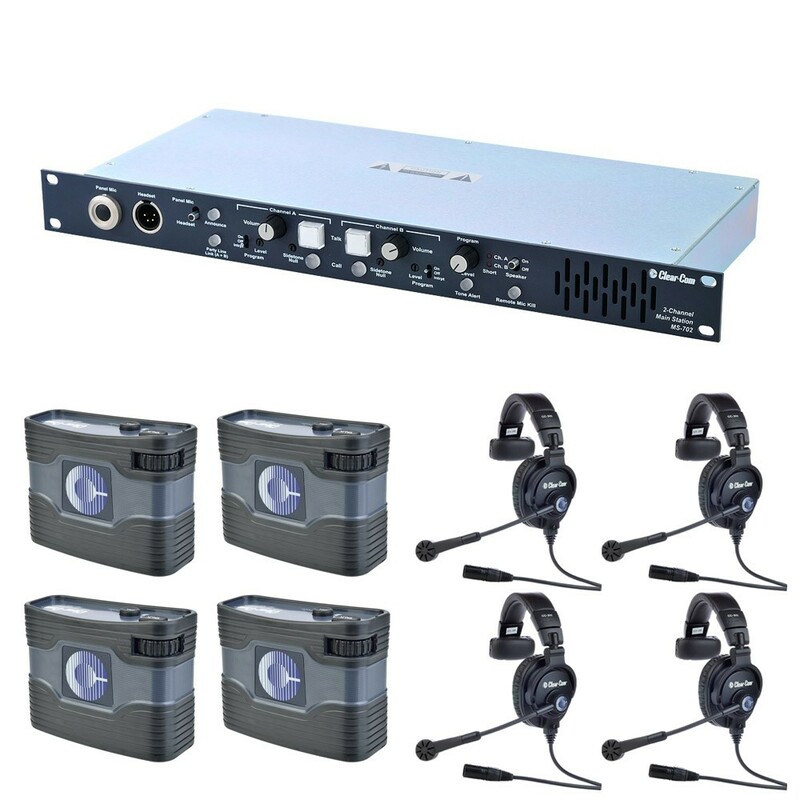 The COM-40FC is a two-channel wired intercom system, consisting of a central power supply, 4 belt packs, featuring a volume control knob and call light, mic on/off and A/B channel select buttons, a branch box, and 4 dual, noise cancelling headsets with an adjustable dynamic microphone. A rugged, foam lined carrying case holds the system in place for transportation and storage. 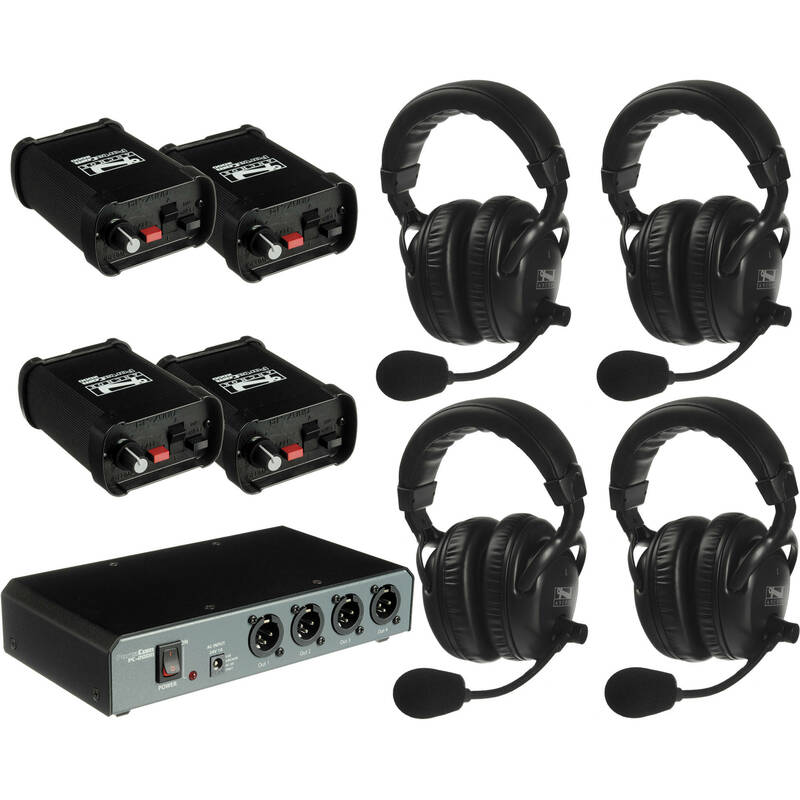 The COM-40FC offers support of up to twenty headsets, made possible by the use of separately purchased, additional branch-box expander units, and connections are made via standard 3-pin XLR cables. The system provides either AC or battery powered operation, and the portable base station power supply may also be rackmounted.